I've spoken in recent posts about how over the past few years, I've found much enjoyment from time spent on trails. Hiking (specifically thru-hiking) has been the primary catalyst for this relationship, but trail running has also helped to keep that passion kindled. So how do I explain the occasional oddity like Badwater. Why would someone like me, so attracted to the great outdoors and the trails, have any interest in running something like Badwater, or even Vol State for that matter? Both of which are pavement pounding road races. Certainly the geology and grandeur of Death Valley were partly to blame for my desire to participate in Badwater, but there is also something else fundamental to my crazy endeavors... something that many ultrarunners and adventurers alike often refer to: An intrinsic curiosity for new challenges. In addition to an obvious love of the trails, I think there is this aforementioned fundamental notion at the root of ALL of my adventures. This notion, and it is ridiculously cliche', that I am absolutely curious to challenge myself in new ways. I think of it like this. I will always love the outdoors and hiking along those beautiful single-track trails, but I also like to simply experience different types of challenges. Nothing should ever feel monotonous, so why not mix things up? I suppose partly for the fun of it, partly to see if I might find a hidden passion for it, partly to see what my body and mind are capable of, and partly...well....because I can. Many of my ultrarunning friends and acquaintances have run "timed" ultras. Quite simply, for those of you that don't know, a "timed ultra" is simply a race that has a fixed time, instead of a fixed distance. Usually the goal of such a race is to see how far you can go over a specific time limit. A race will be say, 24 hours, and you run as far as you can in those 24 hours. Almost always, this type of race contains small, relatively flat loops that you repeat. 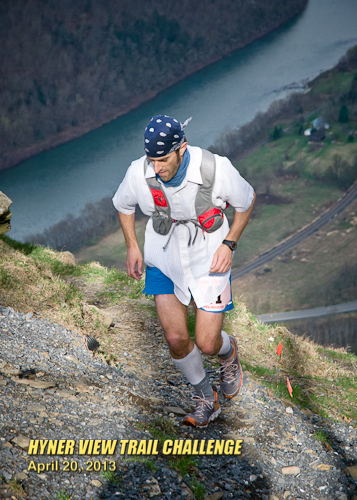 I have never, in my 5 years of ultrarunning, had a desire to run such an event. The thought of repeating a small loop over and over and over for 24+ hours had no appeal to me, and frankly, I thought it never would. Three days ago, I was looking for something to run mid-May, somewhat close by. 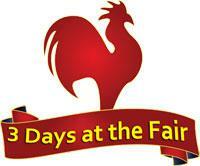 I stumbled across the "3 days at the Fair" race in New Jersey. 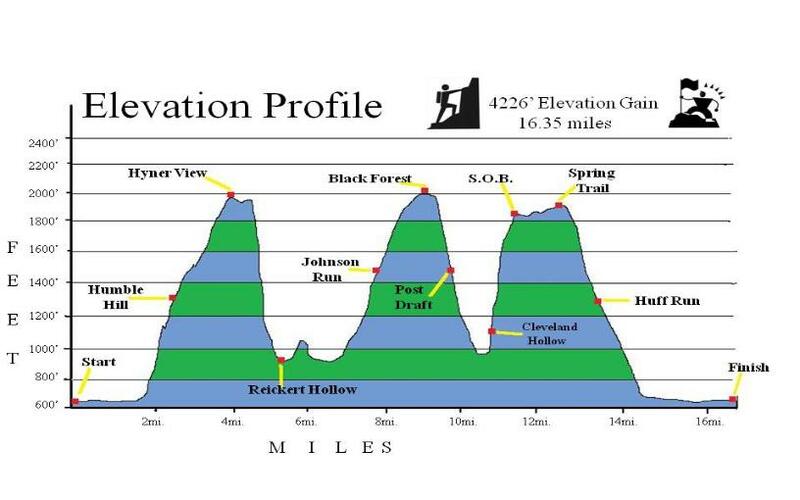 This race takes place over three days, offering several different timed events, all taking place on a 1 MILE LOOP. Yes you read that correctly, it's a 1-mile loop repeated ad nauseam (often literally). WHY ON EARTH would someone like me even consider such an event? Well, simply, because it's the exact type of event I would NEVER consider. I'm curious about the type of people that I'll meet there, I'm curious as to how I'll mentally keep myself together after potentially hundreds of repeated loops, and I'm curious what I'm capable of. I'm curious...and I've never run something like this before. So I signed up. I have no idea what to expect, how long I'll last, how many miles I'll go, or if I'll enjoy it at all...but I want to at least try it. I realized last weekend that I have become so wrapped up in the routine and the numbers, that I forgot why I had been first drawn to running. This is part of the reason for my recent apathy. There was a time when a trail run or even a trail race, much like my past thru-hikes, was about weaving along the serpentine path, with the fresh smell of soil in the air; being able to tune in on the specific bird calls, and then perhaps trade a story with a fellow runner or hiker. I remember vividly during my first ultra (2008 Vermont 50), telling a fellow runner that all I wanted to do was finish and enjoy the beautiful trails as much as possible. At some point since that day, my motivation has changed, my priorities have shifted, and my passion has been suffocated. 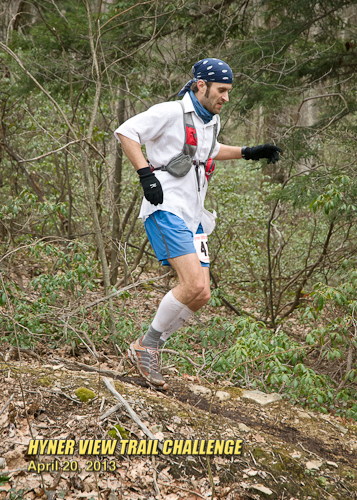 This past Saturday I had a race on my schedule that I had signed up for months prior: The Hyner View Trail 50k. Last year I ran this same race, and it was a rather miserable experience. I ran too hard, without giving myself enough rest the weeks before, and I was too worried about my time/place. I had basically declared after that race that I would likely never run the 50k distance again, and instead stick to the more easy-paced longer ultras. Earlier last week, when I thought ahead to the upcoming race, I really had no desire at all to do it. I had sort of come to the realization that I would just not show up. But then I decided I would not let apathy get the better of me. I made the decision to start the event, but only if I ran it under some new terms. I told myself that if I were to run, that it would be me....and the trail. No matter what would happen and when, I would completely turn off the "compete" switch. I would still talk to and encourage other runners, but I would not allow myself to be compelled to "catch" someone in front of me, or "not let" someone behind me catch me. I wanted to truly enjoy an awesome 50k trail...while also running. In my mind it would almost be more of a 50k thru-hike, but with running. And that's ALL. I decided to wear my heart-rate monitor to make sure I didn't run too hard as well, and my only mental goal was to allow myself to have as much fun as possible. I miss having fun on the trails; I truly miss it. If I felt like scrambling up the rocks, I would. If I felt like running fast down a down-hill section, I would. And if I felt like stopping to enjoy a view, well, I would. I paid 50 bucks to run this event, I was going to enjoy myself dammit. So when I lined up with 100+ eager runners on Saturday morning, I simply closed my eyes, took a few deep breaths, and tuned it all out. I was there to play in the woods, climb some steep hills, and NOT watch the time. When the horn sounded, I ran. I passed some people, a slew of people passed me and eventually I found a really nice pocket with a decent gap in front and behind me. I ran a nice comfortable pace and absolutely loved the light-footed dance along the first couple of miles of hill-side single-track. After a couple of miles, I looked up at the ominous 1400+ foot climb in front of me that leads up to Hyner View, and just smiled. Climbing it was a complete blast and I never once checked my watch. At the top I stopped to admire the incredible view, take a few well-earned breaths, and then begin the fun switchback-filled descent down to Rieckert Hollow. Already by this point I found myself almost completely alone. There were a couple of runners in view up ahead of me a ways, but no one behind me. As far as I was concerned, this was perfect. I was out there alone, for a weekend long-run in the woods. This theme continued for the entire day. I made my way up and down climbs, in and out of aid stations, and through open fields and dense woods, almost entirely by myself. It was magnificent. Miles ticked by and I didn't care. I popped a gel every once in a while, thoroughly stopped to enjoy some really good aid station food, and just kept a nice smooth pace all day. I never really felt like walking much, except for on the steep uphills, so I ran. I made sure to chat with the wonderful volunteers at each aid station, and to thank them for all that they did. At the ~21-mile aid station, a volunteer asked me, "how you doing? ", my response as I started to leave the station was something like, "I can't remember the last time I had this much fun!". To which both volunteers offered me some hardy and prolific hoots and hollers as I disappeared down the hillside. A few times the temps dropped into the high 30's and it even snowed lightly on occasion, but for the most part I was very comfortable. I never cramped, never worried about salt intake or water, I just kept it simple. My feet held up ok, and my knee never got angry. I really did feel like that 8-year old kid thrashing around on the trails in the woods behind my house during summer break. As I neared the end of the race, I was quite content. I could have kept going, but I was quite fine to stop too. When I eventually popped out of the woods at mile 30 and began the last mile along the paved road to the finish, I finally switched my watch so that it would display overall time. I just smiled and laughed at the realization that I had just had that much fun, and still managed to come in to the finish 20 minutes faster than last year. The best part was that I was still having a great time, still smiling, and was completely and utterly satisfied with my day on the trails. That passion had come back, and I was steeped in it. When I crossed the line, I never stopped my watch, and didn't even register the time on the clock. I figured it was ~about 5:45 or so. The only thing on my mind was to sit down and enjoy some post-run food, drink and stories. When I bumped into a few friends of mine eating their well-deserved post-race food, I asked them of their experience. Both had done very well. When they asked me how I did, my response was, "I had a blast!". They answered with, "Well, yeah, but what was your time? What place did you finish?" To which I replied, "Hmmm...I don't know...but man did I have fun out there." The post race food was fantastic and I eventually made my way home, without ever actually checking my time or place. By that evening the results were posted and I did crack a smile and laugh a bit at my own result. I am so glad that I decided not to let apathy get the better of me. My experience this weekend, while it maybe didn't "cure" me of my running-funk, it certainly re-awakened me if not for a little while. I was testing out a new shoe at Hyner. I have been continuing to fight some acute heel pain, and decided to give the La Sportiva Helios a try based on a recommendation from a fellow Barkley Runner. I've never run in Sportiva's before so I had nothing to go on. If anything I really liked the look of the Helios if even just to wear as "everyday" or "kick-around" shoes. I'm a sucker for orange/grey. The Helios, while lightweight, are not "minimal", which is good for me. Minimal, is I definitely something I did NOT want. The minimal movement works for some people, just as the "zero-drop" movement works for others. For me, I still like a nice classic running shoe, with average drop, and adequate cushioning. My 2 cents on this shoe would be, well, that I just really enjoyed running in them. The were comfortable, had ample cushioning and protection, and my feet NEVER hurt in them. Today, my heel feels fine too. 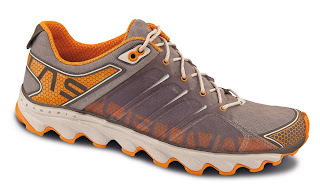 I'm not entirely sure that the Helios are designed for as technical a race as Hyner (very rocky), but for standard trail and even pavement, I think they'd be great. For really technical, Sportiva would probably recommend their Ultra-Raptor or something, but I don't know for sure. One of my favorite aspects of the shoe, was that the grip was remarkable. I don't know what kind of rubber they use on the soles, but I never once slipped, and I ran on some pretty steep, gnarly, muddy, slick stuff. Definitely recommended, but I did have to go 1/2 size up (they run small). As far as downside?....Well, I think it would just be that being light, they aren't as robust as a heavy/hearty trail shoe. Meaning, they probably won't last 500 miles...and they are a bit expensive. Today I decided to dust of the kayak for the year and had some fun paddling up at Black Moshannon again. I managed to navigate my way along the narrow and serpentine creeklet that feeds into the lake all the way up to the Moshe-Hanne foot bridge. It was quite a fun experience hopping my boat over and around the various beaver dams and lodges. On Tuesday last week, there was a local 5k held in honor of a student (Jeremy) who lost his life in 2007 during the shooting at Virginia Tech. This 5k has been held annually for the past few years. This year, the 5k was especially poignant, as it was held the day after the Boston Marathon. Several runners from the local running group here (myself included) came out for the event, and a few folks who were AT the Boston Marathon the night before even ran. At the end of the race, there was a candle-light vigil held in honor of Jeremy, the victims of Newtown, and the victims from Boston the night before. Here is a link to the Local Paper Coverage. 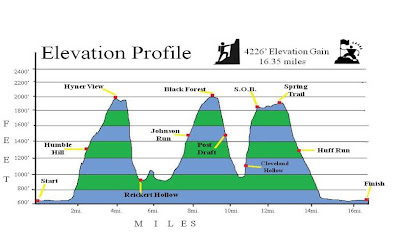 For those of you popping in on here hoping to see a long and detailed race report from my most recent running at the Barkley Marathons, I'm sorry I will have to disappoint. I have decided that the memories and full experience from this year will remain with me, and me alone. I will say these two things: First, despite last year's incredible success, this was the year that I truly came to understand important things about who I am, and what is it that inspires me. Second, being able to witness (and crew) my friend Travis on his incredible finish was certainly the most poignant and profound ultrarunning experience I've ever had. Today I went for my first run in week. I had no watch on, no idea of how far I'd go, and honestly had no desire to leave my apartment at all. It was a struggle to even put on the running shoes. I headed out on a familiar trail, reluctantly, and at an incredibly slow pace. After a few miles, I found myself on a oft-traveled out-n-back trail under the assumption that I would just "do the usual". But then something happened. Randomly while on the return leg, I was overcome by a sudden desire to pop off of the path and head down a small "goat-path" (likely a deer-trail) that breaks off to the left. I had seen this little trail probably hundreds of times and had always wondered where it went...but never took it. I was always in the middle of a fixed length out-n-back, so why would I, right? (At least that's always been my logic I guess). But not today. Today I took it. It weaved through the woods for a while and I had no real feeling for which direction it was leading me. Gradually, after a small climb the trail became smaller and smaller until after about a mile, it simply petered-out and I found myself just standing in the woods....alone. I rightly laughed-out-loud to myself at this seemingly fitting scenario, but then looked up and saw the perfectly clear blue sky through early spring trees. There was no wind, and the woods were incredibly quiet. I wasn't really that far from people, and in fact was probably only a mile or so from the edge of a golf course, but in my little microcosm of forest, I was a million miles from anywhere...and utterly alone. I stood there for a very long time just breathing in the air and taking in the silence around me. It felt good. I looked down at the dirt and leaf-litter beneath me and I felt at-home. I thought back to words I wrote down after my PCT hike describing why it was that I "needed" that hike. I had said that "I was out of alignment, and needed to go someplace that would feel right, would feel like home, and would bring me back into that alignment". Since the days of thrashing through the woods as a 6-year old with my dad, to my long and expansive thru-hikes, to the 50- and 100-milers on the weekends....it is, and has always been, the trails and the woods that feed the passion of my spirit. Each and every one of us has something that we cherish, that feeds our soul. Maybe it's reading, or traveling, or running, or skiing, or hiking. And many of us may come to a day where we realize we have lost sight of the passion behind that something. Perhaps we still do this activity, or we still participate...but it has become rote and mechanical. That passion that we once thrived on, has been clouded over by a facade of the unimportant or perhaps just the things which we falsely believe to be equally as important. It was in the woods today, standing there at the end of the goat-path that I realized this. At some point over the course of the last year I had lost sight of why I seek the trails. My motivation had shifted entirely to that of a numbers game. How many miles could I run in a week, how much elevation gain, how to train for that next race, or how much time could I shave off of that PR? In no way do I mean to downplay the thrill or the exhilaration that can be found in competition, I myself often thrive on it, but for me, it has never been the true drive behind my love of the trails. Deeper within me the true reason had become so buried and clouded-over that my days on the trails have become almost chore-like. Methodically recording my mileages on digital logging websites. Noting my elevation gains, keeping spreadsheets, and compiling those ever so important time/splits sheets. Again, I ask myself....When was it that I lost sight of it? 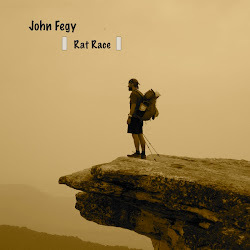 I have often pondered the idea of completing my triple crown and finally doing a CDT thru-hike, and often the first thoughts in my mind are of planning guides, mileages tables, and daily averages. Today standing in the woods, was the first time that I thought of a CDT hike and the very first image in my mind was that of standing on some ridgeline somewhere along Wyoming's Wind River Range and admiring a perfect sunset. So perfect in fact, that it's the kind that makes you realize how small you really are, and how big and magnificent the world can be. The kind that can bring you to tears...and to your knees. That is the feeling that has drawn me to the trails and to the woods. And I had forgotten it. But today, today I remembered it. And I will go out now seeking the trails for the reasons I should have been all along; the reasons that drive and feed that passion within me; the reasons I had forgotten. I will remind myself every day that it has never been about the numbers, or the miles...but about the awe that is awakened within me every time I set foot in the woods. So please, take that goat-path once in a while, and don't lose sight of what it truly is that feeds the passion within you.